78 degrees. That was the temperature when Dan and I arrived at transition area for our pre-race setup at the XTERRA Southeast Championship race last weekend. That may not sound that bad, but you have to consider that it was 5:45 AM at the time. We knew it would be a hot race in Alabama that day. Even though I currently reside in Charlotte, North Carolina, I was born and raised in Alabama. My wife, Alba, is from New York city, and has taken many “back home” trips with me to Alabama. She has created a phrase that describes hot days like that as “Alabama-hot”. No matter where we are, if it is really hot outside, she calls it Alabama-hot. While getting checked in, we saw the regular crew, Janet, Andrew, Jen and the rest of the bunch. It was great seeing them all again. We setup our transition area and set out for a quick warm up ride. We had missed seeing the new section of the bike course during our pre-ride, so we used a portion of it for the warm up. Heading down to the swim area, I hopped into the water about waist deep. The water was like a hot tub. I didn’t even bother doing a warm up swim in fear of overheating. Instead, I decided to lay down on a cold section of grass in the shade while reviewing my game plan in my noggin. 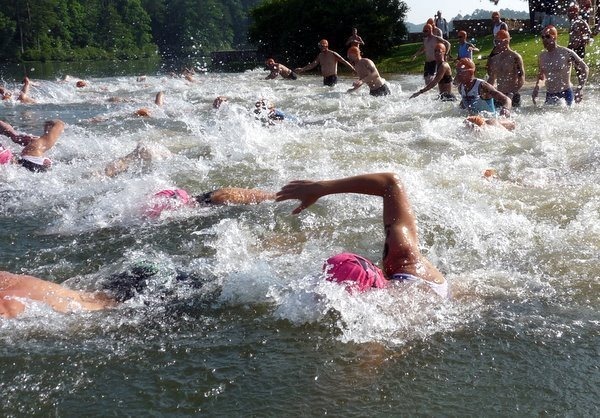 “This is going to be a hot swim,” I thought to my self. I think the advertised water temperature was 83 degrees. Alabama-hot. Before I knew it, we were on the starting line. The infamous cannon fired and we were off in typical washing machine fashion. 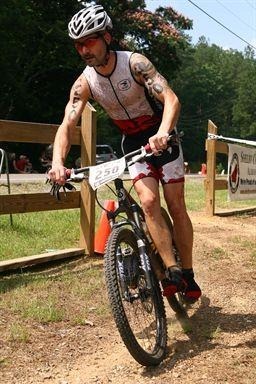 More pics at the XTERRA FaceBook page. The first lap was a bit odd. There were two distinct groups of swimmers and somehow I ended up right between the two in open water. It must have been where I started off the line. I would breathe to the right and see a group of swimmers thrashing. With a breath to the left, I would see another group. I’d site for the buoy and no one was in front. Very odd. At one point, I caught a glimpse of Dan, but lost sight of him somehow in the shuffle. 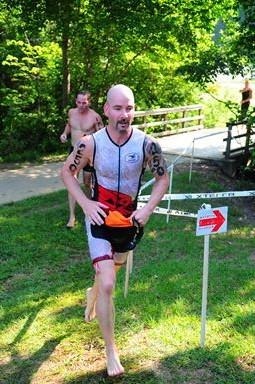 Coming out of the water for the short beach run between the two 750 meter laps, I felt pretty good. I even goofed around with someone taking pictures and gave them double hang-ten hand signs along with a big smile. Wish I could get a copy of that photo (hint, hint). The second lap went smooth as well. I felt like I could have pushed the pace a little faster, but I was really concerned with overheating. The water was just that hot. I decided to stick to the conservative side and save it for the bike and run. 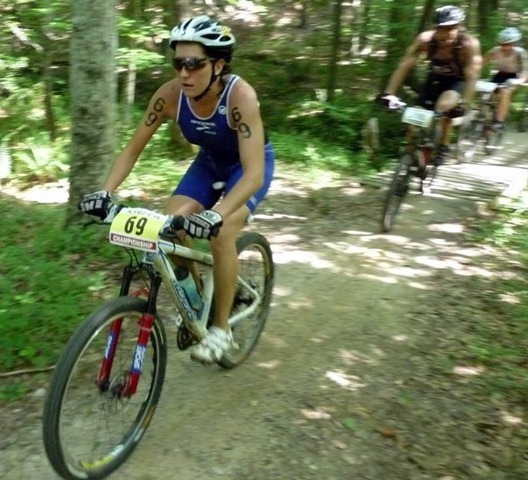 Heading into transition, after the swim, I wasn’t sure about my standings, but knew I was looking forward to the bike. I was surprised to see so many bikes still on the racks when I arrived into T1. With my swim, I felt my conservative pace would have put me further back in the pack, but apparently it wasn’t as slow as I’d thought. I quickly donned my bike gear spying teammie and rackmate Jo Markaham on my way out of transition. Man, that Lazer helmet ROCKS! The ride on the road was short before hitting the trailhead but was long enough for me to chew on, I mean put on, my gloves while riding. 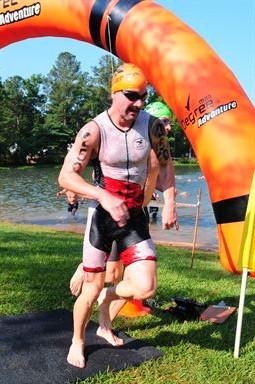 I was still breathing hard from the swim and transition when I hit the trailhead. Once on the trail, it took a little while for me to settle into a comfortable pace and calm my breathing. For the first portion of the course, I had someone right behind me, tagging along as I passed numerous riders. I would call out a request to pass and would hear him say “one more,” adding to my request. We picked off quite a few riders together and I asked him twice if he wanted to pass. After the second time I asked, he stated I was picking some really good lines and that he wanted to just hang with me a while. No problem. Riding together with another rider is always more fun that riding alone. By the time we arrived at the first fire road, we had been tailing another rider for a while. The rider following me took the opportunity to pass the rider in front of us. As he pulled along my side, he said, “Come on, let’s catch the guy in blue!” I glanced down at his calf and saw he was in the 45-49 age division. Good, not one of my competitors. I jumped in behind him but ended up behind the blue rider. The three of us rode up the gravel road in a mini-peloton, drafting. As we went through the water stop manned by one busy, busy volunteer. He handed off a cup of water to the two in front of me while running along side of us, but had nothing to give me. Darn, if he only had three hands. We stayed in our group until the trail turned to single track where I passed the blue rider on the next climb. The two of us stayed together until hitting the long fire road climb. I let him pull away from me on the climb as I took the conservative approach. I had completely blown up on the same climb two years ago when the heat conditions were similar. Alabama-hot. About half-way up the climb, I hear “abracadabra” (an inside joke between Dan and I). “Go get ‘em!" I exclaimed as he slowly passed me. I continued the climb and somehow lost track of where I was. When I reached the top, I was actually a bit surprised that it was over already. On the first downhill I was bombing pretty good, floating across some really rough, rocky sections, just holding on and letting the bike do it’s thing when I hear what appears to sound like a spoke breaking. You know that “ting” sound that everyone dreads to hear. About the same time, something started going wrong with my chain. I couldn’t quite figure it out on the fly, but it seemed like the derailleur wasn’t picking up the slack. The only problem was, I wasn’t pedaling, so there shouldn’t be any slack to pick up. I pulled over to give it a quick inspection and didn’t see any broken spokes or anything out of place. For the rest of the rolling sections before Blood Rock, I continued to have the same problem. Through trial and error, I determined that something was preventing my cassette from free-wheeling. This resulted in anytime I attempted to coast, the cassette would continue to try and throw the chain forward. The only way to prevent it was to pedal all the time, even on fast downhills. Upon diving into the Blood Rock trail, there’s a nice rocky section to jump right at the beginning. I dove off of it flawlessly. However, the flawed part was the speed and angle at which I went into the small turn just after the drop. I overshot the turn and laid the bike down, jumped off and landed squarely on my feet. I only lost a few seconds, but it disheveled me a bit mentally. The rest of Blood Rock went smoothly and I picked good lines going through the really technical section. 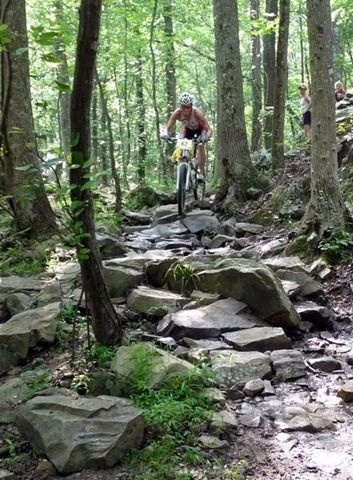 The SWEET downhill following Blood Rock is my favorite part of the Oak Mountain trail. It’s fast, technical and fun as heck. Towards the bottom, I caught up with Pro, Fabiola Corona, being followed by another guy in my division. At the same time, another 40 year old had caught up with us. The four of us continued on the trail until we made several passes. Next thing I knew, it was just me following one 40 year old. Once we hit a pine thicket, I felt something stinging/biting me on the back. “Ouch, what the heck is that? Horse fly? Ouch!” I was thinking while trying to reach it with one hand while the other was on the bars. Not sure what it was at the moment, but it sure stung like hell. Could it have been a yellow-jacket? They do nest on the ground in pine straw (usually). I continued following the 40 year old wondering what my passing strategy would be. A half-mile or so later, I get the same stinging sensation on my left arm. I quickly swatted the critter away and in the process, I felt that, whatever it was, was fairly large. Too big to be a biting fly, it had to have been a horse fly or bee/wasp. As the stinging sensation continued, I ruled out that it definitely wasn’t a horse fly. The sensation lingered way too long. About the time I made that conclusion, another one flew through one of the vents in my helmet and started stinging me on my forehead. I winced. I squinted my left eye. I shook my head. I tried everything I could without taking my hands off the bars in a very tight, twisty section of the trail. When I finally had an opportunity to take my hands off the bars, I banged my helmet. Nothing. Knowing I couldn’t continue a Popeye ride, I loosened my helmet a bit and slid it back on my head, back and forth, until either it flew out or was squished, all without stopping my pursuit of the fellow 40 year old. 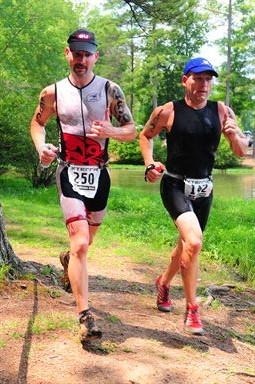 I followed him for the rest of the bike leg and passed him entering transition. Put your right foot in and shake it all about. I met up with Dan in transition where he quickly exclaimed, “Let’s go so we can run this together.” I quickly transitioned and took off after him. I inspected my noggin the best that I could. It was swelling a little but not as bad as I would have thought for a bee sting. Maybe it wasn’t a yellow-jacket. Not sure, but it still hurt like hell. We ran the entire run, each taking turns on the lead. We picked off quite a few people early on in the run, but once we hit the hills, we found ourselves alone, for the most part. The hills were just as tough as I remembered and even tougher given that it was hotter than at the start of the race. Alabama-hot. We finished side-by-side on the run. Dan took 3rd in his division and I took 4th.. Thanks to the BUMP crew for some OUTSTANDING trails. If you find yourself in the Birmingham / Pelham area, you should really hit these trails. When you’re done, hit the bike wash behind the BUMP building. While you’re at it, toss some bucks into their donation box. 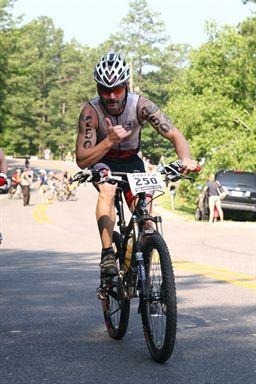 Also, my hat’s off to the XTERRA crew and volunteers for putting on another great race! RACING EAST CHAMPIONSHIP TOMORROW! Race report coming up!